So, what happens when Gary Glitter meets up with Doctor Who? No, it's not a sick joke, and such a meeting wouldn't be allowed today for obvious reasons - I'm pretty sure that Peter Capaldi wouldn't want to meet him, anyway! However, in the 80s the result was this #1 hit single by The Timelords - sort of! 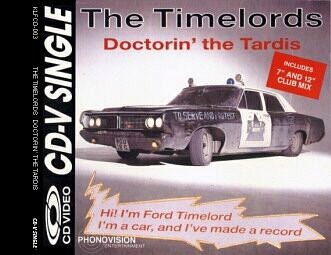 Also releasing singles as The KLF and The Justified Ancients of Mu Mu, The Timelords were Time Boy (Bill Drummond) and Lord Rock (Jimmy Cauter). For this novelty song the duo mashed-up Gary Glitter's Rock and Roll Part Two (this makes up the main beat) with the Doctor Who TV theme music, as well as several other snippets and samples. At one point the daleks can be heard screaming "Loadsamoney!" which was the catchphrase of the Loadsamoney character played by comedian Harry Enfield. The song was originally intended to be a dance/house hit, but with Gary Glitter's sample making up the groove, it sounded nothing like house music and so Drummond and Cauter released it as a novelty record and temporarily re-named themselves "The Timelords". After reaching #1 in the UK, the duo were quick to cash in further by releasing a book entitled "The Manual - How To Have A Number One". The deliberately low budget video features a 1968 Ford Galaxy and some very dodgy-looking daleks! I love the guys feet walking along the ground - a Fred Flintstone moment! More novelty singles can be found on the pages Worst Songs of the 80s and One Hit Wonders of the 80s. A CD Video single - pretty rare!